The Princess and the Frog. I'm a sucker for films with strong female leads, and Princess and the Frog doesn't let me down on that side. Tiana is definitely one of my favourite characters from the Disney movies along with all the other character on this list as well. What really pushes this into the top 5 is the songs. 'All Most There' is one of my all time favourites, and at one point was my wake up alarm in the mornings, I find it is one of the songs I most relate to and that's saying something because I never really relate to songs very well. Pirates of the Caribbean. I never said they were all going to be animated that's why this is allowed on the list. I have not yet met anyone who doesn't like this movie, and with humour, action and romance scenes you really can't loose. As well as the awesome acting of all our characters, it is really one of the best movies out there. Big Hero 6. It took me ages to get round to watching this in the first place as I don't really go to the cinema much so have to wait for everything to be out on DVD. But once I watched this movie it had stolen my heart. What can I say I really want a Baymax in my life. Also, come on superheros what's not to like about it, I do love it when they transform into hero form, definitely when the background sound track if by Fall Out Boy. Mulan. Will and always be one of my ultimate favourites. Though not the most accurate for history's sake (I did go watch the Chinese live action movie of it, 2 hours of Chinese and subtitles, it was worth it) like I said for the Princess and the Frog I do like my movies with strong female leads, it makes me feel strong, then you put the songs to it and you've won me over. Plus Mushu is the best sidekick ever, quick fact the sidekicks often tend to be my favourite characters in movies, I could do with a tiny dragon to watch my back ^_^. Hercules. Finally onto probably one of my all time favourites and even if this wasn't a Disney favourites it would most likely feature. 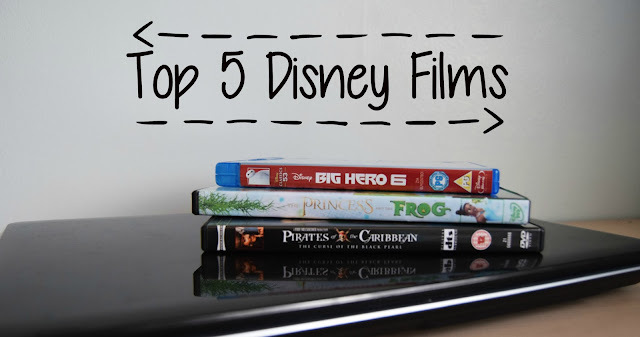 I probably shouldn't admit but I think I've actually watched this movies over 5 times maybe 7 - mind you I didn't really get into Disney movies till year 9 since we didn't have Disney Channel. It is always my go to movie if I'm ever feeling down, and the songs are also ones of the very few I relate to on some level at some point. I also have a love for Greek myths which probably shows with the amount of times I've watch this films. Of course these aren't my only favourite Disney movies, with the likes of the Lion King and Finding Nemo, but these are the once that I've watched on the most occasions. Do we like any of the same films? What would make it into your top 5?